He’s one of the cutest animated animals in cinema and has a wonderful story behind him. There is that one scene though. That one 5-minute scene that just doesn’t seem to fit in with the rest of the film. I’m of course talking about the brilliant, trippy, and iconic scene of Pink Elephants on Parade. Maybe it was the war? Or maybe it was the decline in Disney money? Maybe even the animators and storytellers experimenting with a ton of new drugs brought this vision of Pink Elephants to them. Whatever the case was, this scene is beautiful, crazy, scary, and wonderful all at once. The scene starts where Dumbo is laughed and mocked for having big ears. His mother is locked up and can’t give him love, and he’s ruined a show. It’s a sad and tough time. So Dumbo and Timothy Q. Mouse decide to have some water that is laced with champagne to which they get fairly drunk. 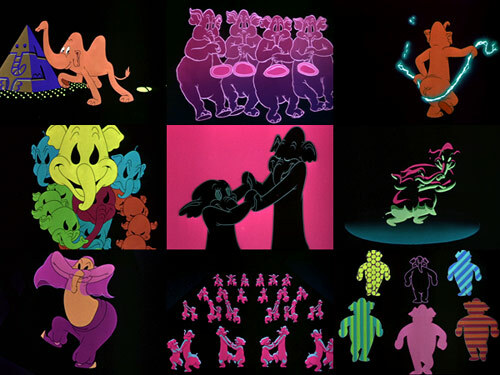 One hiccup bubble turns into an acid trip for the ages as we see a variety of animated neon images of elephants as scary clowns, multiplying, turning into vehicles, ice skating, doing a belly dance, and turning into one single eye. It’s quite fascinating and hypnotic in a way. This could be the effects of drugs or a satire and commentary on the cruelty of circus treatment of animals or clown masks that cover up people’s true identities. Who knows? The song itself was sung by Mel Blanc of the Looney Tunes and Thurl Ravenscroft from that famous Grinch song. It was the perfect duo to make this scene. At the end of this drug induced scene, Dumbo and Timothy wake up in a deep hangover high up in a tree, which is where they realize Dumbo can fly. All is good after that. The old proverb says, it’s darkest before the dawn, which is very much the case with this scene. It’s one of my favorites and also surprising that Disney has never done anything like this since 1941. CLICK HERE FOR DAY #6! This entry was posted on Thursday, June 29th, 2017 at 5:27 pm	and is filed under Film, News. You can follow any responses to this entry through the RSS 2.0 feed. You can skip to the end and leave a response. Pinging is currently not allowed. « Warner Bros. Announces the King of Horror Collection!